We don’t believe in luck, but we do believe in the power of thankfulness! We recently discovered Gratitude Jars. Have you heard of them before? We found them as we were window shopping at Miscellany, a cute little shop in The Village at Castle Pines. In my excitement, I told Giff I wanted us to do that. 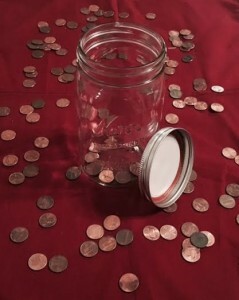 Every time we found a penny, we would remind ourselves of something we are grateful for and put it in the jar. That was a week or so ago, and we have not done it yet. Sometimes the enthusiasm fades when you are not in the moment. Out of sight, out of mind! A week or so later, Andrew, my son with autism, was having a particularly hard morning and was agitated. As he left my room, he knocked my glass bowl off my dresser. All of its contents (loose change, batteries, hair pins, etc.) went flying across the floor. Pennies went EVERYWHERE! I was able to get him calmed down and on the school bus, and I went about my day. That same morning I found out that Frontier was offering flights to Dallas, Texas for $15. I couldn’t believe it! We had already been planning a car trip to Dallas in April to visit the Bible college we had both attended, to see old friends and to do some sightseeing. But our dream started to fade when we realized it would still be too expensive for our family of six to fly there! So, imagine my excitement when I heard that each of us could fly round trip for $30! Immediately, my sour attitude from Andrew’s outburst that morning had changed! Andrew does not do well with long car trips. So when I heard about that last-minute deal Frontier was offering, I immediately texted Giff. He began to look into booking the tickets for us! It seemed too good to be true! And as the saying goes: If it seems to good to be true, it probably is! There were lots of hidden fees that added up quickly, and we were back to where we started. It was still cheaper to drive there instead of flying! For some reason, that put me in a bad mood! A really bad mood! I accepted the invitation to the pity party where I was the guest of honor. And with each text Giff sent telling me of yet another fee that Frontier would charge and how it was going to be too expensive, I grew more and more angry and disappointed! I cried–literal tears, because I couldn’t do something I wanted to do. Giff was doing everything he could to try and make it work, but to no avail. I felt like a 2-year-old throwing a temper tantrum, but I didn’t care! I wanted to give full release to my inner child and just throw a big fit, but I restrained myself. My 17-year-old twins were home after all. What kind of example would I be? So I decided to just host this pity party in my bedroom behind closed doors by myself. I was rehashing everything that happened that morning, playing it over and over in my head. I was sinking further into a funk. And true to my nature, when I’m in a funk, EVERYTHING is wrong. Just wrong! No longer was my bad attitude just about Andrew throwing the bowl across the room or not being able to fly to Dallas for $30. It was about my LIFE! When we lose sight of our blessings, we start to complain and being discontent about everything big and small! While I was in my bedroom, I figured I might as well clean it. I started folding the laundry that had accumulated on my bed, and I decided to go ahead and clean up the mess Andrew made earlier that morning. As I was picking everything up, it hit me! I’d like to say, I texted Giff what God had spoken to my heart and that my mood was lifted. But it took me a little while to come around. I did text him the little object lesson I felt God just gave me, but I quickly erased it. I didn’t want to be held accountable to what God had spoken to me. I wanted to stay in my pity party just a little bit longer. I felt justified. Eventually, I did come around though. By the time Giff got home from work, I had released it to the Lord, and I am okay (really okay) if we don’t go in April. Because I know when we do go, we will be going with His blessing! That alone is worth all the pennies in the world! I told Giff just today about that little Holy Spirit encounter with the pennies. God is speaking all the time. Sometimes even in the most common, everyday things, He speaks. If we allow Him, He will use whatever means necessary to speak to our hearts! We need listening hearts. Read I Kings 19:11-13! Elijah was depressed. The Lord told Elijah to prepare because He was about to pass by. There was a mighty windstorm. Yet the Lord was not in the windstorm. He was not in the earthquake either. Nor was He in the fire. He was in the sound of a GENTLE WHISPER! Be prepared for God to speak to you using the most common ordinary stuff of life! Are you listening? He can even use pennies to speak to your heart. I will never again dismiss a single penny I find. I will use it as an opportunity to get my heart right by being thankful for all that He has already done. 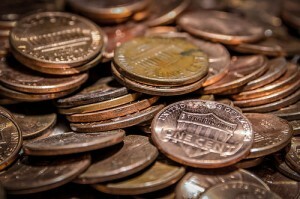 I challenge you that when you find a penny, pick it up, but don’t wish for luck! Tell God what you are grateful for in your life.